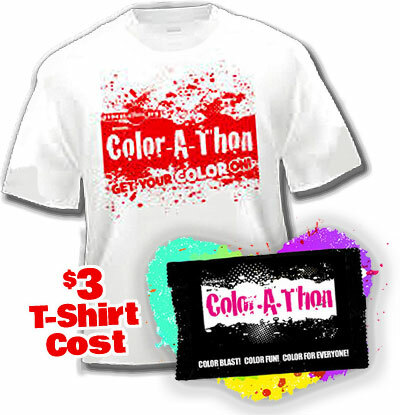 Our Entry Fee-Based Color-A-Thon program is the Perfect Option for High Schools, and for Community Events! From Start to Finish, School-A-Thon Will Provide You With Everything You’ll Need for a Successful Event! 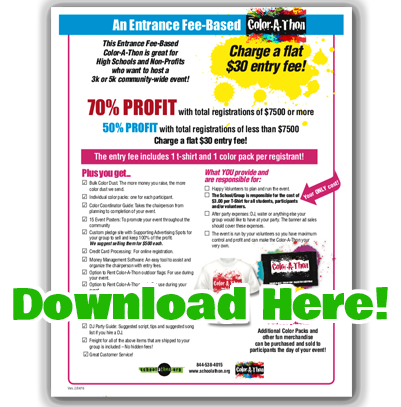 Earn up to 70 percent profit with a School-A-Thon color run entrance fee-based event. The popular craze that’s taking over the nation is perfect for high schools or nonprofits looking to host a 5k community-wide event. We suggest that each entry fee include one color pack and a T-shirt. We’ll provide the color packs and you purchase the T-shirts for just $3 each! Bulk color dust. The more money you raise, the more color dust we send. Individual Color Packs. Each participant receives one. Color coordinator guide. This School-A-Thon color run expert will advise the chairperson from planning to completion. 15 event posters. Use these to promote your event throughout the community. Color-A-Thon 5k registration fliers. Hand these out to spread the news and gain participants. Credit card processing. This service makes it easy to accept your Color-A-Thon 5k registration fees online. Credit card fees included. We cover this expense at no additional charge, so you can keep the maximum profit from all your Color-A-Thon 5k registration fees. 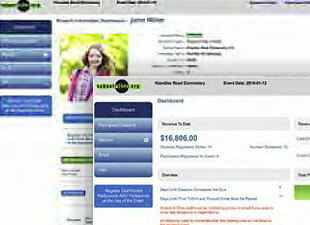 Money management software. This easy-to-use tool assists the chairperson with organizing entry fees. Student awards program. Great incentives like personal color packs, sunglasses, wigs and more help make your School-A-Thon color run even more fun. Optional Color-A-Thon outdoor flags and/or arch rental. These are ideal for use during your event. 30 route marker flags. These flags make marking your course easy and help to guide participants. “Feed on Fitness” Twitter feed. This feed provides healthy lifestyle suggestions kids can use for life. DJ party guide. This guide includes a suggested script, tips and recommended song choices for an optional DJ, if you choose to hire or enlist one. Custom event site with banner ads. Your group can sell the website banner ads and keep 100% of the profit. We suggest selling them for $500 each. Included freight shipping. That covers all of the above items that are shipped to your group. Excellent customer service! The start-to-finish support will make hosting your School-A-Thon color run as easy and successful as possible. Excited and eager volunteers. You choose your team to plan and run the event. $3 per T-shirt. These can be for participants and/or volunteers. After party expenses. This may include a DJ, water or anything else your group would like to have at the party. Keep in mind that banner ad sales should cover these expenses. Your own flair. The event is run by your volunteers, so you not only make the maximum profit but also have maximum control to make the School-A-Thon color run event your very own. Ask your School-A-Thon color run sales representative for more details. Color-A-Thon Kick Off Video for Fee-Based Events! T-Shirts can be for participants and volunteers. Your only cost is $3 for the T-shirt, shipped to you! Take Your “Thon” to a New, Exciting Level! Discover fantastic services, more participation and more profit! We Make Hosting a Color-A-Thon Event Super Easy! 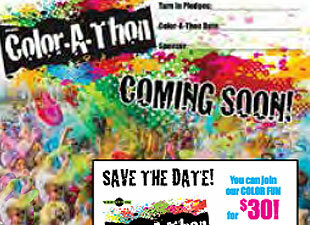 A 12-page guide that will take you step by step through the entire process of the planning your Color-A-Thon event. 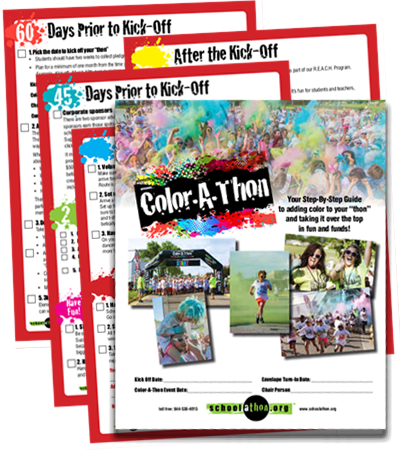 From the initial planning stages with your committee, the Kick-off, all the way to the actual Color-A-Thon event – and after, this guide maps out everything you’ll ever need to do. Tools to Boost Your Event Participation and Sales! Mobile-friendly Event Website for community registration and for promoting your event. • Take walk up registrations right up to the start of the event! • Ad spaces to sell: use the profits for your After Party! We suggest selling these banner ads for $500 each. • Social media buttons to spread the word! promote and execute your event. • Sponsor Portal to download everything! 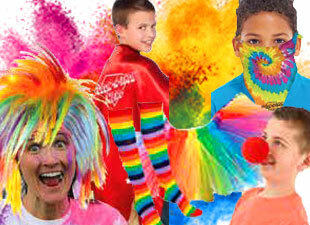 Dye packs, t-shirts, wacky wigs, sunglasses, colorful tutus, stockings and more all at a low bulk price.